How can I help spread the excitement of Big Give McCook? Support your favorite non-profits with a donation on November 15th from midnight to midnight! Be loud and proud to show the community’s generous spirit — especially on social media! Tell your friends and family about it! Donations to participating organizations can be made online at biggivemccook.org or in-person at select locations. Donations must be made during the giving period (November 15th from midnight to midnight) to qualify for matching funds. How much of my donation will go to the non-profit? The non-profit organization(s) you choose to donate to will receive the full donation if given via cash or check. Donations made online will be the full amount minus PayPal's credit card processing fees. 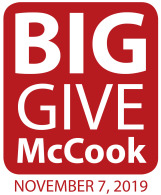 Big Give McCook takes no percentage of your gift. Who is participating in Big Give McCook? The Big Give McCook invited verified 501(c)(3) nonprofit organizations that are charitable in nature and are located in McCook to participate. Yes. All organizations participating in the Big Give McCook are verified 501(c)(3) organizations and will issue you a tax-deductible receipt following your gift.